We honored our veterans today by going to the local Memorial Day parade and watching the cool military vehicles drive by. I thought of my brother (who is still alive, fortunately, and doing what he does best--irritating those closest to him) who serves in the military by performing root canals on other military personnel with dental problems. Thanks Mike for your service! And more thanks to the rest of the men and women out there who have served our country with their time, energy, might, and mind. I'm just popping in to say that I spent a most wonderful afternoon at the lake beach with the kids, Jim, and a friend of Jim's from high school and his family, and my mother. Our kids and the Halterman kids got along great, despite not knowing each other very well yet. My Jim and Lynn Halterman have been friends since they were kids. The temp was near 90, but the humidity was low. No cloud dared cast a shadow over our picnic. We sat by the lake with our feet in the water, watching the boys play in the water and find giant sticks on the lake bottom. Other Jim brought his frolf (frisbee golf) hole (a.k.a. the Festivus pole) and the bigger boys had fun with that for a bit. Even the sunburn on my neck feels right. More conference running action! 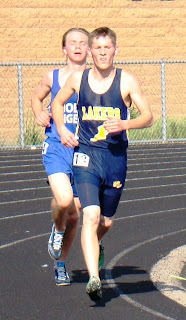 Paul ran the 1600m yesterday in the conference meet. He and the other boys from his team all had fast enough times to run in the "fast" heat. The day was much more pleasant than Tuesday so we were hopeful. Here he is, off in the distance, running. I've labeled the important parts of the picture for you. Paul had a pretty good race. He ran it in 4:50. Not his best but pretty close. He came in 9th place and just made it to the podium--or next to the podium. They don't have a step for 9th place. But they had a ribbon for him. The conference placement. Our team was the only team that had all three runners place in the meet. Carl got 6th, Justin got 8th, and Paul got 9th. Woo! The Lakers boys track team milers: Carl, Justin, and Paul. Carl and Justin both graduate in a few days. After I took this picture, Justin commented, "Well, that was stinky!" I tried not to get too close after that. Quickly I mustered all my nerves and flung the beast off me. I grabbed the nearest sharp implement (a mechanical pencil) and stabbed it as hard as I could. I texted Jim to tell him of my near-death experience. Had he not had some work to do, I'm sure he would have rushed home to be by my side in this time of mental anguish, a severe case of the heebie-jeebies. In my blog post from yesterday I mentioned that Paul got a hair cut. He got it shaved pretty short, compared to how he's had it for several years. Most of the guys on his track team buzzed their hair. Not at a salon or barbershop, but at the track. I saw them huddled in a group when I went to pick up Paul one day and I asked him what the boys were doing. "Buzzing their hair." Paulie said. I should have shoved him back out the door and had the kids do it rather than spending $13 to have it done at a store. Just kidding. For some reason, the hair cut made him look older. See? He looks older than his almost-16 years. 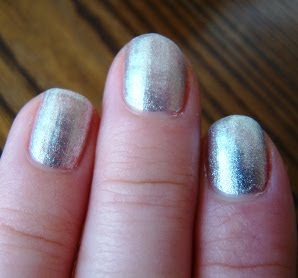 When I was a little girl, I loved metallics--anything gold or silver in color. I especially liked silver. I wanted silver shoes in the worst way. I finally got them when I was nineteen and wore them out. Yesterday, my love for silver was rekindled. Witness:Wow, my fingers look like uncooked sausages. Here's a picture where they look a little slimmer: Sister Jen, I'll have you notice that I did not get finger nail polish all over the skin around my fingers. I would like to mention that most of the time I don't wear nail polish. I don't get manicures (or pedicures). I have a nasty habit of chewing on my fingers and I've noticed that nail polish isn't all that tasty. But. I do like to wear it to keep myself from chewing on my nails every 6 months or so when my nails start to get long, which they are right now. And I saw this polish at Target and just HAD to have it. It's hot today. I don't like hot. But I do like feeling much better after being ill over the weekend. I think I can actually leave the house today. Too bad it's hot out. Did I mention I don't like hot weather? I want to move north in the summer. In less sweltering news, I'm three assignments away from being done with my Personal History class. I had made a goal to finish it before Other Jim officially graduates from high school. With his party coming up very soon, I'm not sure if I'll make that goal, but it will be close. I might have to submit the last assignment (which is a big one--over 40 pages long--but comprised of edited versions of five or six of the assignments I will have turned in by then) after the party. Next up after that, Poetry. Limericks. It's gonna be all limericks. Speaking of which, I wrote one for my mom. She asked for a poem on Mother's Day and I didn't come through for her (sorry Mom. Frowny face). It's stake conference today (explanatory link provided for those of you who don't know what stake conference is) and I'm missing it. I don't remember going often as a child--it was sort of a Get Out of Church Free card--so I never really thought of it as important as going to regular church services where we take the Sacrament. Now that I'm a regular old adult, though, I enjoy going because usually I sing in the choir and get to sit up on the stand and I can hear everything. I'm cleaning out my freezer. It's something I haven't done in, oh...since...um...ever. The ice is thick on the walls, even though it's supposed to be a frostless freezer. Cleaning it out is a long process because we are trying to eat our way to the bottom. At first it was great--I had a whole week of meals for which I had to buy not a single thing! I had meat in the freezer, veggies in the freezer, and fruit in the freezer! We ate well. For the first few feet down. For the last week or so now, we've been eating off the layer of older food. We've been eating freezer-burned chicken and fish. There is one more nice vacuum-packed roast left (thanks Jake!) that hasn't suffered and we'll get to that Sunday. But today I reached a new low, both in spirit and freezer layer. I refuse to eat applesauce that was dated 8/99. Matt said, "That's almost as old as I am!" I went for an hourlong walk this morning and was back BEFORE Matt went to school! I finally did it! I exercised before sitting down to the computer! I like having kids that get themselves ready for school. The only thing is that sometimes they forget things. Like Matt did this morning. Today is Fun in the Sun at Matt's school--essentially a day-long gym class. It's a lovely day outside and Matt will have fun. I got back from my walk as he was making his lunch. He had his baseball cap sitting by his lunch. He asked me where the sunscreen was, which I got out for him because it was on the top shelf in the bathroom closet (presumably put there as a safety precaution against my children accidentally getting it out and eating it). I also reminded him that he had to bring a water bottle. So he had all of it out on the counter ready to go. Pumpkins and carrots and beans, oh my! I will plant my garden today. No slacking off. It's nice out, the garden has been tilled, and I have no plans except to babysit. Fake Child would like to help too. So there is no excuse today for not putting in some seeds. I'm posting this here so that I have to answer to you. I'm forcing myself to suffer accountability. I've told you all that I am going to get the garden going today, so that I am less likely to make excuses not to do it. Ask me tomorrow if I did it. I try not to be a downer on my blog. I don't much like reading blogs of people who whine and moan and think that life has not treated them fairly. So I try to be upbeat. Any complaining I do is more of the facetious "woe is me!" *hand to the forehead* (trying to be funny) type of complaining. Life has blessed me in many ways. And I try to be more pleasant than whiny-funny. I found more stuff to complain about. Bear with me. And keep in mind that I am in no way in need of comforting; there is nothing wrong; I'm still happy about other things. 1. I found a tick on a laundry basket this morning. 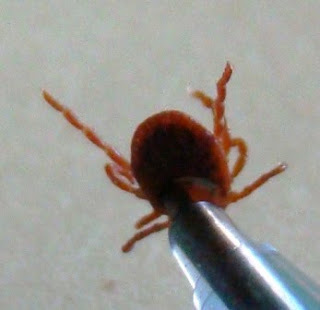 *shudder* Now I am worried that my house is infested with ticks. I'm afraid of going in long grass. Plus I have the heebies and every little itch or tickle has me flailing around like I'm covered with disease-infested ticks. GET THEM OFF ME! Ten things that are broken in my house. 1. is partly my fault. I sat on the couch last night and the repairs that Jim made previously to it decided to give out with a loud thunk. Matt and Hayley had a good laugh at my expense. 2. The breaking of the couch caused me to think of other things in the house that I am currently mad at, like all the window frames. All of them have broken pieces. 3. The deck door too. 4. The hot water tap in the laundry tub leaks. 5. Some cupboard doors' hinges (bathroom and kitchen) are falling off. 6. The closet door in the sewing room is non-existent (well, it exists, but it exists in the garage, useless for blocking the mess of the closet in the sewing room from judgmental eyes--mine). 7. All the outside faucets leak. 8. The ceiling in the bathroom around the skylight leaks and it is terribly stained. 9. The B-flat below middle C on the piano is tinny. It's coming sooner than I thought it would. And mostly I'm okay with that. Thanks to Jen for taking the picture, thanks to whoever owned the garage door for not coming out and wondering what we were doing, thanks to Jen for finding the font that I swore I had on my font list but didn't, and thanks to OJ for standing there and silently mocking the rest of the world in his pose. 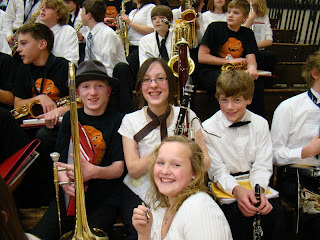 Hayley is now a full-fledged bassoon player in her band. Her band put on a concert last night and I got to see her on her new instrument (I heard her too!). Here she is with some friends. The girl in front said to me after I took the picture, "And no posting this on Facebook!" I didn't promise not to post it on my blog. Her hand on the keys. She played some low notes. I'm supposed to be doing housework. But I have a ten things list. 1. I can put away the laundry Jim folded yesterday. He folded many many baskets and I can put away what he folded. And I did already. 2. Use the food I have in my freezer instead of buying more stuff at the store. I need the freezer space because a graduation is coming up and I'll need the freezer space to store the cake after I bake it. And it will be a large cake. 3. I will get the job I was supposed to do on Saturday done today. I do have an excuse for not vacuuming and dusting the living room, though. Piano lessons went WAY long because several hours of time were not actually used for piano lessons (Jim took the piano teacher, aka my mother, to Best Buy to get a new computer) and because we were given free Twins tickets for Saturday night (a last minute thing) and we spent only one hour at home all the waking hours of the day. Other Jim is preparing to leave for Rochester this morning to go to Prom with Edna. He says he's going to stay the night at her house and then leave early in the morning so that he will be home early enough for Mother's Day. I don't know why it surprises me that he would actually make that concession. He's never remembered Mother's Day on his own before. Maybe Edna reminded him. OJ didn't have time to rent another tux since he only got asked to Edna's prom earlier this week so he went to Men's Wearhouse and bought himself a SUIT. On his own. With his own money. He loves his suit. He brought the vest home immediately and spent one evening trying on all his dress shirts and ties with the vest and strutting around in front of the mirror. I picked up the rest of the suit last night and I heard him late last night, after he got home from hanging out with some friends, trying on his suit. The actual game was a downer, since the Twins were shut out 2-0 by the Orioles, but I enjoyed wandering around the new stadium taking pictures of this strange new baseball environment. Jim and I walked around on several decks. This is the upper deck. I ate Chinese while walking around. I didn't have dinner before we left. Under the upper deck you can see SKY. You can also get rained on. A very flat Bert Blyleven. This bird (a hawk perhaps?) sat up on the first base foul pole most of the night. 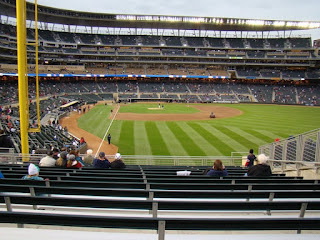 Since the game was a yawner (the Twins got shut out 2-0), the crowd, especially in the outfield, watched the bird swoop off the pole and eat insects. They'd cheer every time the bird swooped. The camera crew caught on and showed occasional live footage on the big screen of the bird sitting on its perch. 1. I'm having a difficult time getting the groove on today. 2. For example, I didn't exercise this morning. 3. And I'm still wearing my bathrobe. 4. I'm rationalizing it all by telling myself that at least I've started the dishwasher and the washing machine. 5. But then the bed isn't made. 6. Then I start thinking about getting a different job. 7. But I'm afraid of change. 8. OH, I haven't eaten breakfast. 9. Maybe that's my problem with today. 10. Baseball game tonight in the new stadium! First time for me, second time for Jim, who WENT WITHOUT ME when I was flying to Utah to visit Katie. I'm still bitter. He loves the new stadium (more than he loves me, I think sometimes, because he talks about it all the time. I doubt he talks as much about me to other people). Bonus thought: Am I jealous of the new baseball stadium's hold on Jim? I believe I am! He vomited on the couch. We don't know when. But we just found it yesterday and it was all dry and crusty. He got some on a box of photos that had been sitting on the couch so we had to take all the photos out and put them in another box. Fortunately, the photos were still in envelopes so none of them were wrecked. But I thought while we were cleaning, I should scan the photos into the computer for safe-keeping. So here are a few photos, which I'm posting because the cat threw up. And no, I didn't take pictures of the cat vomit. They are in no particular order and all of them are from the year 2003, except for one which is from the last day of 2002. 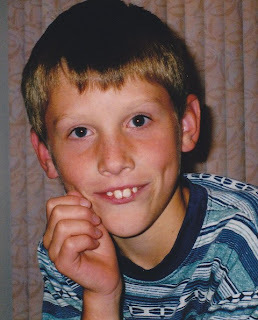 A nine-year-old Paulie who I think in this picture looks a little like his Uncle Mike (yes, I said Mike, not Dave) here. And it's not because he's making a face at the camera. It's the eyes. Spring is here, and that means it's time for all good senior boys to rent tuxes and buy flowers in unnatural colors for girls who want very badly to dress up like princesses and to go to a ball. And Other Jim, being a good senior boy, did just that. He took a girl from down south (all the way from Rochester, MN). He tends to go with out-of-school-district girls because he's a rebel (not. I don't know why he likes to take girls from not around here to dances). Turn back now if you don't want to look at girls in pretty dresses and boys looking clean and dandy. Other Jim places the corsage on Edna's wrist. Going outside for pictures. The group is pretty large--13 couples--so it takes some time to wrangle them into place. OJ gets his boutonneire pinned on after his father arrives with a pin. Look at the rainbow of prom dresses!